MFA League Champions Trophy: College Corinthians MSL 0 Park Utd A 1. Section A: Bohemians 1 Castleview 3. Section B: Grattan Utd A 3 Kanturk 11. Section C: Kilreen Celtic 1 Pearse Celtic 2 (Game abandoned after 30 mins). Section D: Knockavilla Celtic 2 Carrigtwohill Utd A 1. 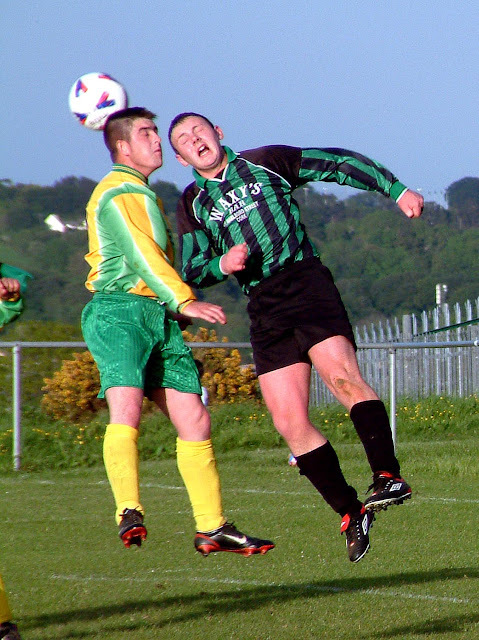 AOH Cup 1st Round: Glanworth Utd 1 Leeds 3; Los Zarcos 3 Tower Ath 5 (aet); Blackstone Rovers 4 Ard Na Laoi 1; Hibernians A 3 Glen Celtic B 2 (aet); Glenthorn Celtic 2 Shandon Celtic 0; Richmond A 4 Casement Celtic 0; St John Boscos A 0 Churchvilla 2; Village Utd 3 Killowen 0; Central Rovers 0 Carrigtwohill Utd B 1; Macroom B v Coachford A (off); Buttevant A 3 Springfield B 3 (Springfield won 5-3 on pens aet); Springfield A 7 Buttevant B 0; Riverstown\Brooklodge Utd 3 Donoughmore Ath 1; Evergreen 1 Greenmount Rangers A 2; Ballinhassig A 2 Ballincollig 1; Douglas Hall 1 Blackpool Celtic 0; Castlelack 1 Dunbar Celtic A 4; Hillington 3 Knocknaheeny Celtic 2 (aet). Premier League: Greenwood 1 Blarney St Ath 1; Killumney Utd v Macroom (off). Premier A League: Glen Celtic 2 Innishvilla 2. AUL 1: Knockraha 3 Cathedral Celtic 3; Dillons Cross 4 Watergrasshill 2. AUL 1A: Rathcoole Rovers 2 Millstreet Celtic 1; Glenvale 4 Grangevale 0. AUL 3: Parkview Celtic 0 Greenwood B 3; Innishvilla 2 Ballinhassig 1; Richmond 4 UCC 1. AUL 3A: Dunbar Celtic 1 St John Boscos 2. AUL 3B: Rylane Celtic 1 Bweeng 0; Kanturk 0 Greenmount Rangers 4; Newmarket 6 Coachford 0.